All above unitized and mounted on five axle crane carrier, powered by Detroit 12V71n diesel engine, with Allison Model 5860 transmission. BLOCKS: BJ UNIMATIC 6150 150 ton blocks and hook combination; 4 sheaves. KELLY: 4 ¼” Square Kelly, with 6 5/8” regular connections, complete with BAASH-ROSS master bushing. ROTARY TABLE: GARDNER-DENVER 17 ½” X 44” complete with split master bushing. SUB-STRUCTURE: 8’H Substructure, with, back on ramp for rig, Matting boards; Rat Hole and Mouse Hole; V door ramp. FUEL-GENERATOR HOUSE: 2,800 gallon capacity fuel tank, with transfer pump; Junk Box; Lubester; STATE LINE 60 KW generator complete with all necessary switches, gauges and controls; Powered by PERKINS diesel engine, Model 4PKXL04. All unitized and skid mounted; Unit has all necessary electrical boxes, and controls. All of the above mounted on 1979 DORSEY tandem axle trailer, S.N. 140535. MUD PUMP: WILSON GIANT 6 ¼” X 14” duplex mud pump, with extra high pressure fluid end; Quick change caps; HYDRIL pulsation dampener; OTECO relief valve; Powered by DETROIT Model 12V71 diesel engine, with clutch; All unitized and skid mounted. 300 Barrel capacity water tank, skid mounted. Open top mud pit, 260 bbl capacity. 2,500 gallon capacity fuel tank, skidded, with transfer pump. Elevators, slips, and handling tools required for drilling. 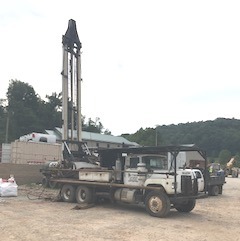 1982 Bessinger & Stein Model A32 (Cooper 32-32) double drum service rig with 1" x 8" x 65' 125,000 lb. capacity hydraulic raised & telescoped double poles, air clutches, 10" double brakes, 2-rear hydraulic outriggers, Detroit 6V71 diesel deck engine, 5-speed transmission, auxiliary hydraulics circuit, 10,000 lb. auxiliary winch, approx. 5,500 ' of 9/16" galvanized sand line, 7/8" tubing line, McKissick 3-sheave 150 ton traveling block, fold-up cat walks, tool boxes, tool rack, mounted on a 1988 Mack R688S tandem axle truck chassis with 300 hp Mack diesel engine, 6-speed transmission, cab protector, oilfield front bumper. It is in good condition. Available tooling; Eckel power tongs with inserts for 1-1/2" to 4" pipe, air slips, weight indicator, sand pump, swab tools, lubricator, elevators, elevator links & line counter.